OUT of season : please book in advance! 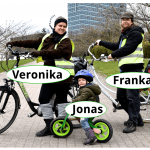 This comprehensive bike tour introduces you to the Vilnius of locals. 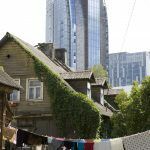 Cycle through the historical Old Town, a modern business district, a charming quarter filled with little wooden houses and a Soviet-era residential area for an unusual, unexpected and unforgettable impression of the city. 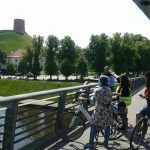 Our bike tour not only introduces you to the beautiful medieval Old Town enjoyed by countless tourists every day, but also the Vilnius of locals. See the city as it really is with its joys and worries, grandeur and monotony, modernity and parochialism. This is your opportunity to get a taste of local life and feel the real spirit of the city while learning about its history, legends, language and culture. There’s also the possibility to stop for snacks or dinner at a traditional restaurant. Please note that “All Sides of Vilnius” is not a typical city tour. 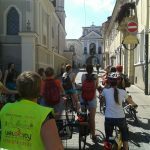 Rather than being a one-sided storytelling session by a knowledgeable but tired guide, this tour is highly interactive – your guide, while still knowledgeable, will encourage questions, comments and participation, making it more of an adventure of discovery uniquely tailored to your personality and needs. As a result, we never end up running the same tour twice! This was a fabulous way to see Vilnius. Veronika’s fascinating tour was amazingly relaxed and informative. She loves to teach and share perspectives — both about modern Lithuanian society but also about transition from an occupied country to an independent nation. The tour included a stop for traditional Lithuanian food, and she was able to give other great insider tips for the rest of my time in the city. 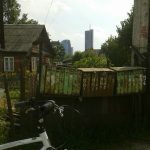 They also rented me a bike for the day following my tour, and gave me suggestions on where to go biking — and I had a wonderful day biking out into the countryside north of Vilnius. I would recommend this tour enthusiastically. My friend and I did the bicycle tour with Veronica and loved it! The tour only cost 50Litas / €15 and lasted almost 7 hours. Veronica was an excellent guide and shared interesting details and sights to inform us about the history of Vilnius. We were particularly interested in Soviet times and she showed us some Soviet era flats and other buildings / architecture from this period. She has a degree in Eastern European history (or similar) and is very well informed. We found her very interesting. My only concern is that she is heavily pregnant and was training someone else to take over. This girl did not seem anywhere near as good or near ready to take over so I urge you to ask who will be taking the tour. Thank you Veronica for our best day in Vilnius!